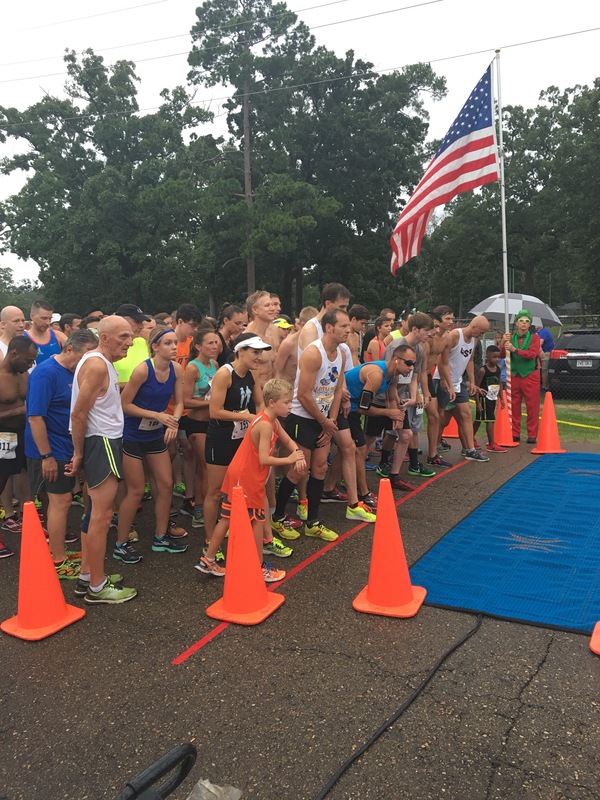 The Watermelon 5k in Hope, Arkansas was race #13 in the Arkansas Grand Prix series. To be honest this was probably one of those races I would not have done had it not been for my goal of Iron Runner. There are certain races in the series that require a little more of a drive and this was one of them. Hope, Arkansas is about 2.5 hours away from our house. I tried making hotel reservations a couple weeks before the race but everything was already sold out because of the big Watermelon Festival. We ended up staying in Arkadelphia Friday night which was on the way but still a 45 min drive from Hope. This race happened to be the day after the first day of school so we made a mini family trip out of it. We got to Arkadelphia around dinner time Friday night and went straight to Cracker Barrel which was right by our hotel. You can never go wrong with Cracker Barrel! After dinner we checked into the hotel and took the kids swimming. Then we watched some Olympics and got ready for the morning. We needed to be checked out by 6 am if we wanted to get to the race with enough time for me to warm up and get our race packets. Saturday morning the kids slept during the 45 min drive to Hope. When I looked back and saw them all sleeping I had this emotional mom moment in my head. Someday when my kids look back on their childhood are these early morning race memories going to be good or will they think it was too much? There’s usually at least one a month- sometimes two. I looked at my oldest son who was in the most uncomfortable sleeping position ever and I thought about him being in high school. Was he going to still want to come with us then? Would we even still be doing this as a family? What about when he was on his own after college? Would he remember these early Saturday race mornings? I’m pretty sure I can blame my crazy mom emotions on all the back to school drama. This year my youngest started kindergarten and my oldest started junior high. We made it to Hope with about 40 minutes to spare before the race. I jogged over to packet pickup and the restroom area. Then I jogged back to our car to help John get the kids bibs and timing chips on. With three kids and myself this part took several minutes. I warmed up right around 2 miles and then it was time to head to the start! My plan for this race was to pace at or just under 6:00 min pace. Typically in a 5k my goal is in the 5:45-5:55 range but given the warmer summer temps and that this race was 13 days after the San Francisco Marathon I didn’t want to go out too fast. My coach recommended mile 1 at 6:00 so that’s what I did. There was a college age runner who took off in front of me. 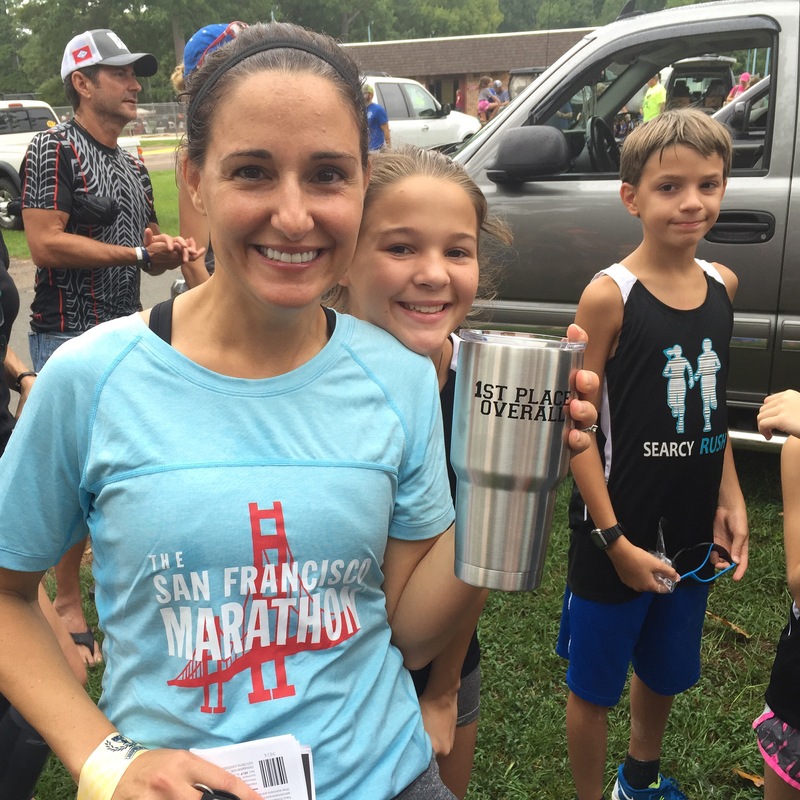 I reminded myself to focus on my pace and not worry about placement during mile 1. Mile 1- 5:57. Right where I wanted to be. I still felt good and by mile 1.5 I was starting to gain on the first female. Around mile 1.7 we were going up a hill and I decided to pass her then. After passing her I kept pushing my pace for a couple minutes to get a better lead. Mile 2- 6:02. The hill slowed me down a little but I was glad my overall average was still right on pace. I just had one more mile to stay in the lead. Mile 3- 6:02. This mile went much better than my more recent last miles have gone. I was very happy with my splits for being so consistent. 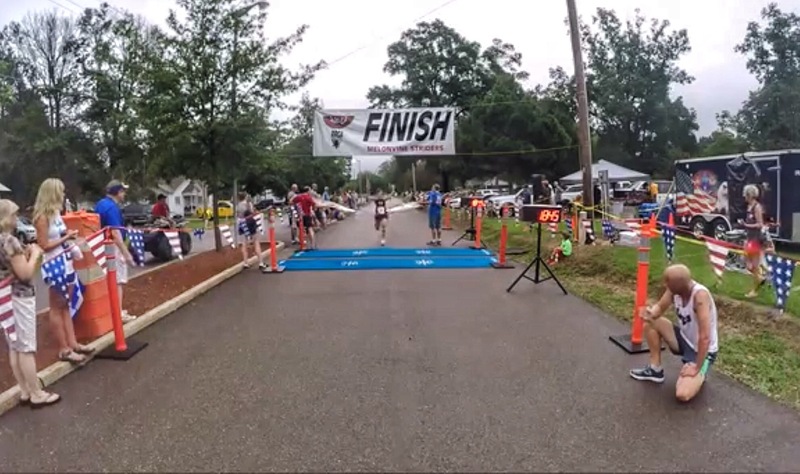 The second female finished about 20 seconds behind me. I grabbed some water and started my cool-down back to find the kids. Somehow I missed seeing my oldest daughter but I saw my son and then found my youngest daughter. 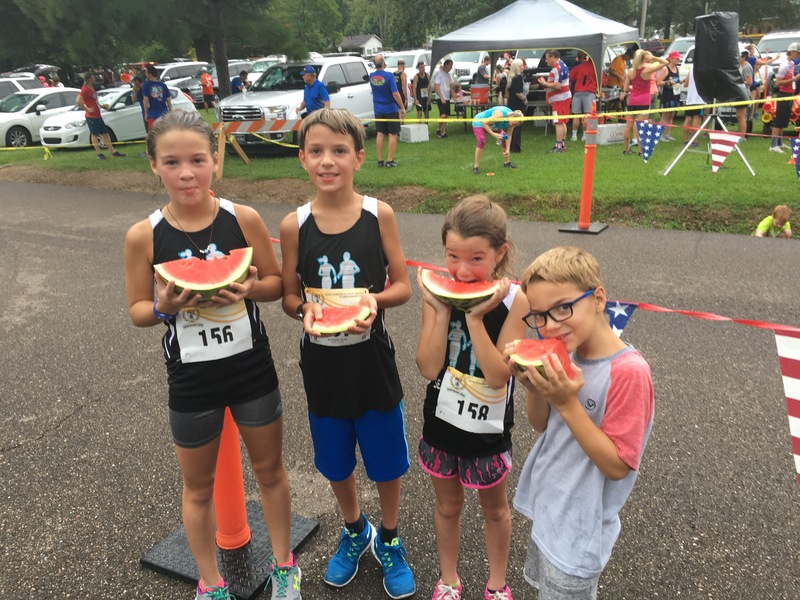 My middle two ran their fastest 5ks ever! Kids Times: Abi- 25:13, Anthony- 26:52, Anna- 30:40. At the awards ceremony I won my first Yeti cup which was a nice surprise! 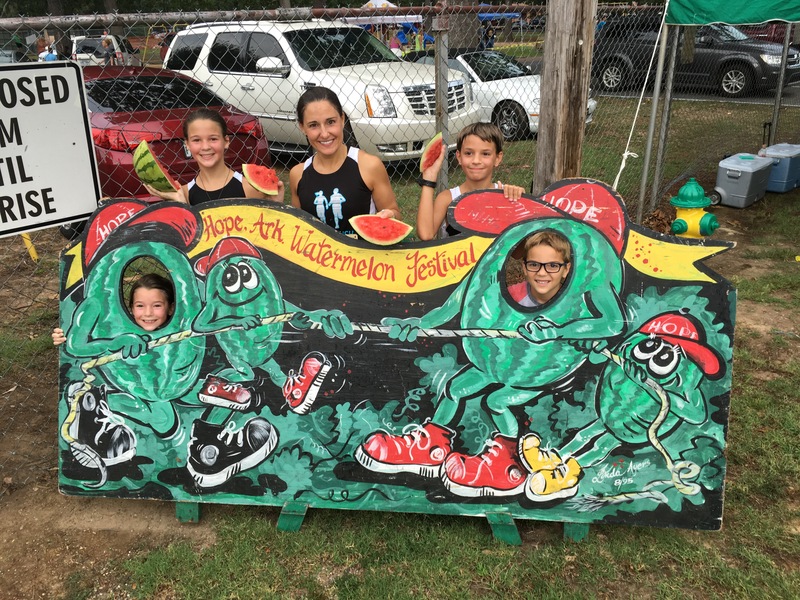 Every participant was given a big watermelon to take home too!! All in all a good morning for everyone! Thankful I was able to run a better paced 5k. There are 7 more GP races to go! 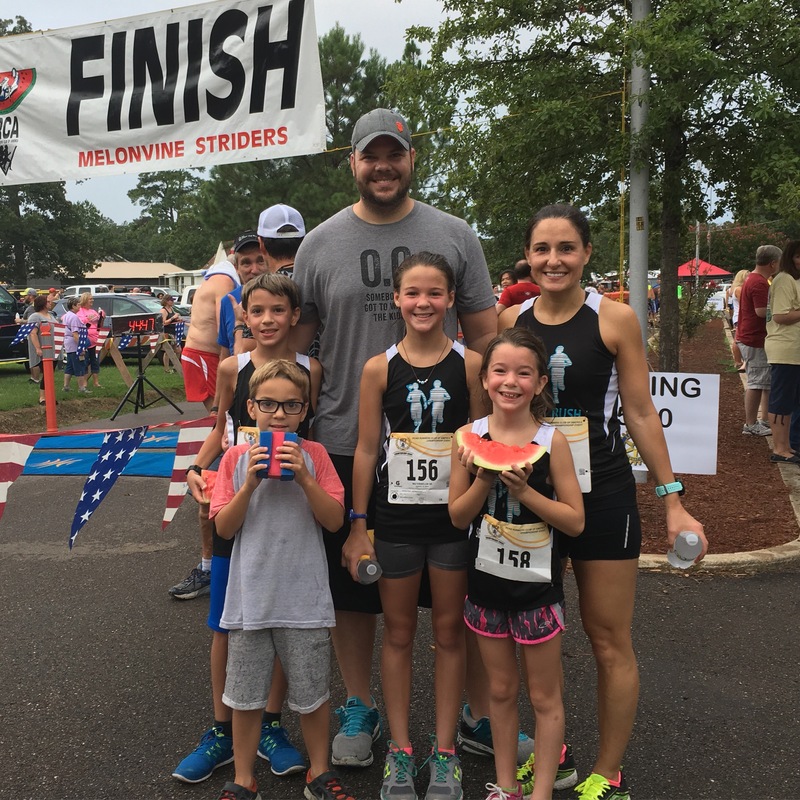 The way you talk about your kids and running always makes me tear up, and I don’t even have kids. I just think it’s cute how involved they are in your sport, and how good you are about involving them, too. We didn’t really do anything like that growing up, so I have almost nothing in common with my parents, including memories, so I think your kids will look back fondly (I actually think kids remember almost ANY family activity with positivity – even the bad experiences. Sometimes rough times are the times families bonded or banded together to work as a unit, etc. and kids remember that stuff. ).